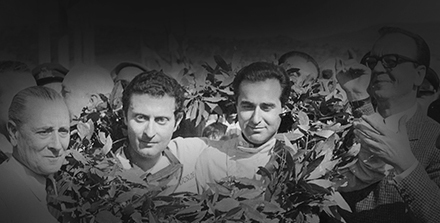 Paul Frere was one of the youngest founder members of the Grand Prix Drivers Club and had only retired from racing two years before. He was also a very talented man with deep technical knowledge and an ability to write. Even whilst he was racing he was writing interesting technical articles for magazines and was one of the first European journalists to be successful writing for the emergent Japanese car magazines. His articles became beacons of information in Car Graphic, edited by his friend Shotaro Kobayashi. This led him to become a consultant to Honda and Mazda. He was also European Editor of the American magazine Road and Track. All of this, of course, was in the future. Born on January 30 1917 in Le Havre in Normandy where his family had moved during World War 1. His father, Maurice Frere had been named Minister for Economy in the Belgian war government which had moved to Le Havre during the war. Paul was just two and a half when the family moved back to Belgium and his father was a member of the Committee for War Reparations and his interest in cars started with the family Fiat 501. Paul’s first motoring competition was mild compared to what was to come. It was a Gymkhana held in Austria. Paul had only recently gained his driving licence but he borrowed his mother’s rather staid looking Amilcar and won the event. After University and keen to develop his interest in cars he wrote an article on the handling difference between front wheel and rear wheel drive cars which he submitted to the legendary engineer and journalist Charles Faroux who was Editor of La Vie Automobile and it became his first published article. He had also developed a lot of skill in drawing which he used to illustrate some of his work. This was not going to keep the wolf from the door so he had jobs as Service Manager for Kaiser-Fraser in Brussels and with General Motors’ department in Antwerp. He married and his first real family car was a 1925 Ballot which was big enough to take him, his wife and children however his interest in motor cycles had not left him and in 1948 he entered his 125cc Austrian Puch in the 1948 Brussels Grand Prix. As was common at the time he used a pseudonym “Frepau” so that his parents would know he was racing. However he really wanted to race cars and one day met a school friend called Jacques Swaters who had an MG Special and Jacques proposed they entered the car for the 1948 Spa 24 Hour race. To their surprise they finished third in their class and Paul Frere’s racing career had started. In 1950 the RAC Belge ran a Production Grand Prix race for saloons and classed by the list price of the car rather than by engine capacity. Paul, reasoned that as the 850cc Dyna Panhard was the cheapest car in the lowest priced car he hastened to the Dyna Panhard importer and persuiaded them to lend him one of their cars : by this time Paul was a well known journalist and Dyna Panhard saw some publicity in it. Paul won the race outright. This led to him persuading General Motors to enter four Oldsmobile 88s with Hydramatic transmission for the Production Touring Car event at Spa. He had as one of his team mates Andre Pilette, father of our vice-President Teddy Pilette. Again Paul won the race but admitted that he had to coast down the hill to the finish line having run out of petrol. The Belgian Automobile Club offered him a place in the Belgian Grand Prix of 1952 if he could find himself a car. He tried John Heath at HWM who refused but later offered him a race in an HWM at Chimay which he won and Heath changed his mind and offered him an HWM for the 1952 Belgian Grand Prix where he finished fifth, the highest placed HWM. This led to him being invited to race a factory Porsche at Le Mans and Paul Frere’s International racing career was on its way. In total Paul Frere raced in six Grands Prix the final two, in Ferraris. In 1955 Scuderia Ferrari ran him in one of their ungainly Super-Squalo’s. 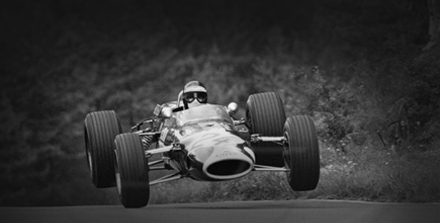 In his two races with the car that year he finished 8th at Monaco and 4th at his local circuit, Spa. A year later and this time Ferrari had the more impressive Lancia-Ferraris and Paul had his highest grand prix finish with second place, again at Spa. When you consider the calibre of drivers competing in grand prix racing at that time Paul Frere proved to be more than above average, particularly as he was never signed to race a full season with any of the teams and in some ways was still considered a journalist who raced rather than a more accurate assessment as a racing driver who was also a journalist. For example, take Paul’s performances at Le Mans. His first was in 1953 sharing a Porsche 550 Coupe with Richard von Frankenberg. They finished 15th overall and won the 1500cc class. The following year he shared a factory Aston Martin DB3S with Carroll Shelby but they retired. He missed 1955 and then in 1956 drove a factory Jaguar with Desmond Titterington but going into the second lap on a slippery track he spun his D type and hit the banking hard pushing in the rear of the car. He tried to drive it back to the pits but in vain and had to retire. A year later, however, this time in th4e Ecurie Nationale Belge D type Jaguar he finished in 4th place. 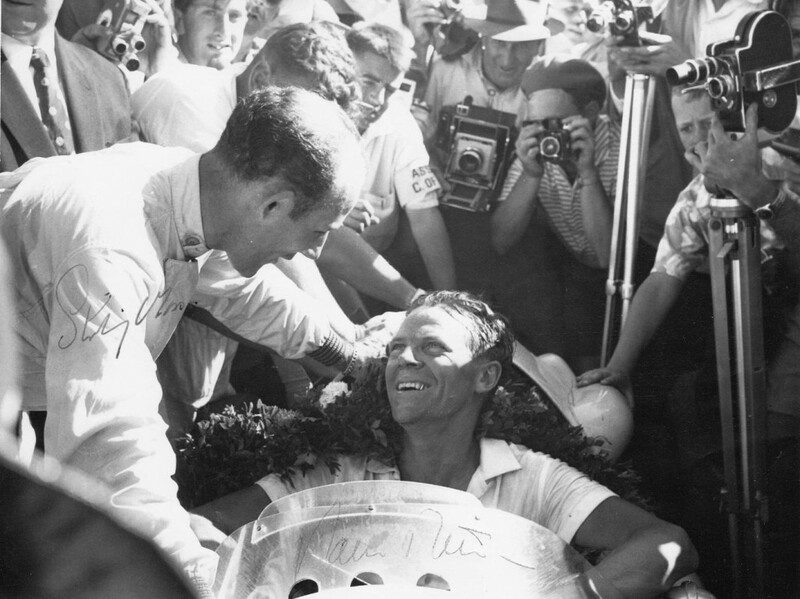 In 1958 he again finished in 4th place this time with Edgar Barth in a Porsche RSK winning the 1500cc class. For the 1959 Le Mans race he was drafted into the Aston Martin team and finished second with Maurice Trintignant in a DBR1 and then his crowning glory, winning Le Mans in 1960 with his Belgian friend Olivier Gendebien in a factory Ferrari TR60. For Paul it was the moment to end his racing career, a career that covered a wide range of contrasting cars that underlined not only his pace but his versatility. 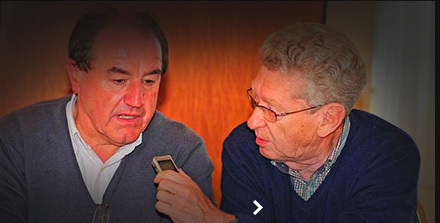 For the rest of his life he became one of the finest technical and descriptive motoring journalists of all time. His racing had opened many doors and in retirement he was to test drive most of the racing cars of the succeeding periods. Such was the faith manufacturers put in him was illustrated in 2003 when during a break at the Le Mans Test Day Audi let Paul go out, test and demonstrate their new R8 Le Mans car. He was 86 years of age at the time! As a writer he wrote many books including Sports Car and Competition Driving, which was a valuable book for young people wishing to drive racing cars. 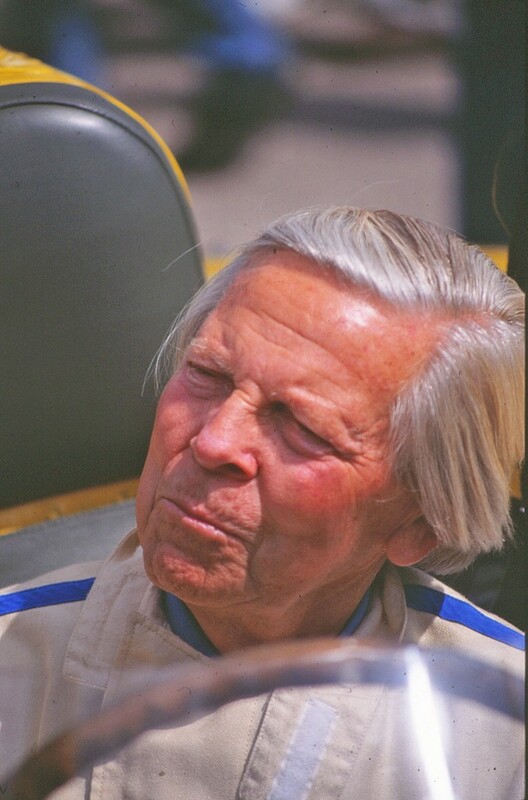 He died in February 2008 at the age of 91 and will always be remembered not only as one of Belgium’s greatest racing drivers but a kind and gentle man who was well liked wherever he went.